This reading group guide for You Got This! 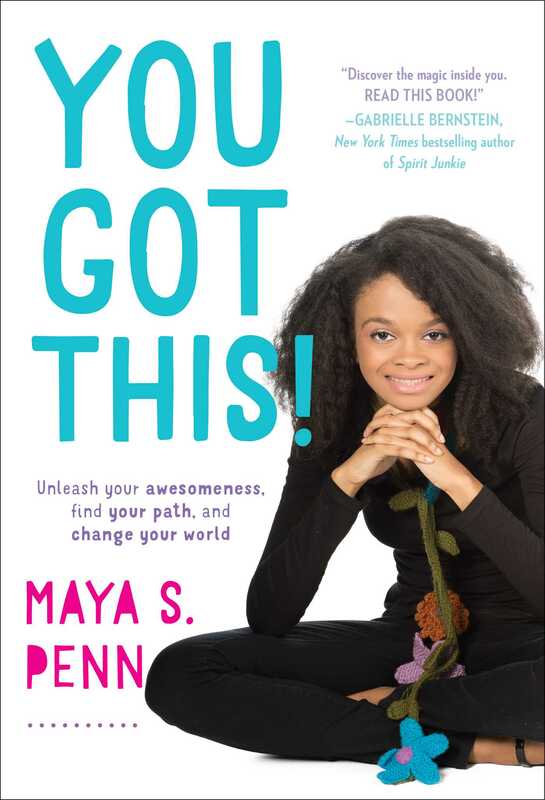 includes an introduction, discussion questions, ideas for enhancing your book club, and a Q&A with author Maya Penn. The suggested questions are intended to help your reading group find new and interesting angles and topics for your discussion. We hope that these ideas will enrich your conversation and increase your enjoyment of the book. In You Got This! Maya shares her incredible journey to becoming an artist, designer, philanthropist, and business owner. She provides a creative blueprint for teens and young adults, along with the tools she used to build an authentic, exciting, and connected life, and offers creative prompts for cultivating success. So let your creativity and passion flow freely and watch as your world transforms. It all starts with you! 1. In the beginning of the book, Maya talks about “doing it afraid.” In Maya’s words, “doing it afraid” means “it’s best to acknowledge the fear you feel, and then go ahead and do that scary thing anyway.” Do you think this is true? Have you ever felt scared to do something and then done it anyway? How did you feel during? How did you feel after? 2. Maya points out that there are lots of interesting and unusual jobs available that many kids don’t even know exist. Because Maya loved drawing and cartoons, she was particularly excited about becoming a professional animator. Think about your own hobbies and interests. What would your dream “interesting and unusual job” be? 3. Maya taught herself HTML coding in order to customize her website without having to rely on expensive website-building programs. Was there a time when you used out-of-the-box thinking or problem-solving skills to solve a problem? Discuss. 4. Do you agree with child development experts who say that “play is children’s work?” Was there ever a time when you learned something important about yourself/your interests while playing? What did you learn? 5. Maya believes that we all fall into one of three categories when it comes to making big life decisions: Flip-Floppers, Blank-Drawers, and Under-Thinkers. Based on Maya’s descriptions, which do you think you are? Why do you feel that way? How can you use Maya’s tips (such as building a dream board) to zero in on your passions? 6. Did you take Maya’s advice and build a dream board? If so, what did you learn? Were you surprised? How will you put the passions you discovered into action? 7. Standing out from the crowd is an important part of pursuing your passions and chasing your dreams. However, sometimes feeling “different” can be hard. Have you ever been bullied because of your differences? Have you ever bullied someone else for being different? 8. Maya has a number of “friend-tors” who provide friendship, encouragement, and advice. Do you have any role models or mentors in your life? What characteristics do they possess that you admire? How might they help you accomplish your dreams? 9. Are your parents the “Up-for-Anything Parents,” the “Follow-in-My-Footsteps Folks,” or the “Parents Who Just Don’t Get It?” How might you use Maya’s advice to get your parents on board with your creative idea? 9. Maya uses the Internet to run her business, connect with friends, and much more! However, she also stresses the importance of being safe and smart online. How do you use the Internet to safely pursue your passions? What are some online safety tips that you’ve learned? 10. How do you react to fear—are you a “Deep-Freezer” or a “Sprinter”? How can you use Maya’s advice to conquer your fears and pursue your passions? 11. Do you agree with Maya that “Perfection is the enemy of good?” Why or why not? Can you think of a time when perfectionism prevented you from finishing a project? 12. Having a supportive circle of friends can be very important when growing your “Big Idea.” How might you get your friends on board with one of your causes? Can you think of ways that you could help another friend pursue his/her Big Idea? 13. Maya talks a lot about the importance of activism. Are there any causes that are important to you? If so, what are they? How can you get involved, or start a cause of your own that will make a difference and change your world for the better? 14. Maya identifies several “Youth Who Are Changing The World.” What characteristics do these young activists share? How can you employ some of those characteristics in your own activism? 15. How has Maya’s advice changed your outlook on your own life? Which parts spoke to you the most? Are you excited about starting your own business, forming a school club, or creating a charity? How do you plan to unleash your awesomeness? 2. Maya learned all about animation by watching YouTube tutorials. Now it’s your turn! Think of a craft or activity that you’ve always wanted to try (some ideas include: knitting, Adobe Photoshop, hair braiding, dancing, or origami) and then follow a YouTube tutorial that shows you how. Remember, practice makes perfect! For the fortunes, write down quotes that you like/positive messages of inspiration. Bring the homemade cookies/handwritten fortunes to your next family gathering/sleepover/friend hangout. Enjoy as your family and friends discover the handwritten notes inside and encourage them to use your messages as inspiration for their own dream boards! 4. When Maya started her own business, she had no idea how much work was involved in actually running it! Now that she’s had some experience, she knows the importance of a business plan—a written report that outlines the company goals and provides a roadmap for achieving those goals. Follow the steps that Maya outlines in the book to create a business plan for your very own dream business. Make sure to include a market analysis, sales strategy, financial projections, and management structure. Keep your final product in a safe place—you might need it sooner than you think! 5. Research local charities in your community and sign up to participate with one that interests you! It might just give you ideas for how to form your very own organization. Why did you decide to write You Got This!? I get so many emails and comments and messages every day from kids, teens, and adults who have been inspired by my story and want some advice on how to get started on pursuing their passions. I eventually decided a book would be the best place to share all my advice and stories with the world. Tell us about the process of writing the book. What did you like best? What were some of the unexpected challenges you faced? I really treated this book like a journal. I just wrote my thoughts and stories about my journey every day over the course of a year, which was a great creative outlet for me and a way to reflect. The main challenge was organizing everything I wrote that year and putting it into book form. What’s the most rewarding part of being a “young” entrepreneur and activist? What’s the most challenging? The most rewarding part of being a young entrepreneur and activist is learning and experiencing all of the amazing things that I have on my journey at a young age and knowing I can apply a lot of the things I've learned in these experiences in adulthood. It’s clear that you have a very special relationship with your parents! How do you think their interests and passions helped to shape your own? My parents are both entrepreneurs and artists, and this has definitely been passed down to me. They've especially influenced me when it comes to philanthropy and giving back. You’ve met so many inspiring role models in your journey, many of whom have gone on to become mentors and friends. Is there anyone you haven’t met yet that you’d like still like to meet? It's so hard to pick just one person! It would be absolutely a dream come true to meet Oprah, George Lucas, and Steven Spielberg! Being a known public figure at such a young age can be tricky! Do you have any advice for staying grounded and true to yourself? It’s always important to remember the reasons you started your journey. At eight years old, my only goal was to use my creativity to give back and positively impact the world. That still remains my goal today and I'm always grounded in that goal. You mention the importance of stepping outside your comfort zone to try things, even if you end up failing. Can you think of a time when you tried something new and failed? What did you learn? Not everything I do goes 100 percent the way I want it to. Starting my own company caused me to step out of my comfort zone and I’ve failed plenty of times throughout the journey of starting and running Maya’s Ideas. But I learned from all my experiences and mistakes and that helped me improve as my company grew. What are some tips for becoming more environmentally responsible in your home or classroom? Are there any everyday changes that kids can make to start making a difference? There are easy steps everyone can take to make a difference. Things like turning off the light before you leave a room, turning off the water while you brush your teeth, and recycling make a huge impact whether you know it or not. As a fan of animation, do you have a favorite animated movie or television show? Why is it your favorite? Movie-wise, I love pretty much every Pixar film in existence. Watching Pixar films taught me a lot about storytelling and developing characters and worlds for animation. Currently my favorite animated television shows are Gravity Falls and Steven Universe! What are the benefits of homeschooling? How has being homeschooled allowed you to pursue your passions? Being homeschooled definitely allows me to have a more flexible schedule to focus on my education as well as my passions. I’ll do four hours of school work (with lunch) and then I’ll take an hour or two to focus on my company, nonprofit, animation, etc. Then for the rest of the day I’ll hang out with friends or family, read, draw, play games, and just have time to be a kid. My parents and I always make sure I’m able to focus on my education as well as my various projects and that we don’t get overwhelmed. I think that getting a good schedule and still taking time to be grounded, have family time, and be with friends is important. I’m currently working on my animated series The Pollinators! I’m so super excited to release this series. I’m also continuing to work hard on my nonprofit and start some new projects with it! Maya Penn is an award-winning philanthropist, environmental activist, entrepreneur, filmmaker, eco-designer, keynote speaker, artist, animator, coder, illustrator, and writer. She is the CEO of Maya’s Ideas, a company she started in 2008 when she was just eight years old. She creates eco-friendly clothing and accessories. She loves to use her creativity to give back. 10-20% of her profits go to local and global charities and environmental organizations. She also started her own nonprofit called Maya’s Ideas 4 The Planet, where she is working on an ongoing project to give back to girls in developing countries. She also helps girls pursue their passions in technology and STEM fields. She has been featured in Forbes, Time, NPR, CNN, O Magazine, Essence, The View, The Steve Harvey Show, Huffington Post, The NRDC, Entrepreneur Magazine, Wired, Black Enterprise, Cosmopolitan, Ebony, The Atlanta Journal Constitution, and many other publications. She’s done three TEDTalks. Maya’s TEDWomen Talk has gone viral, with more than a million views worldwide. 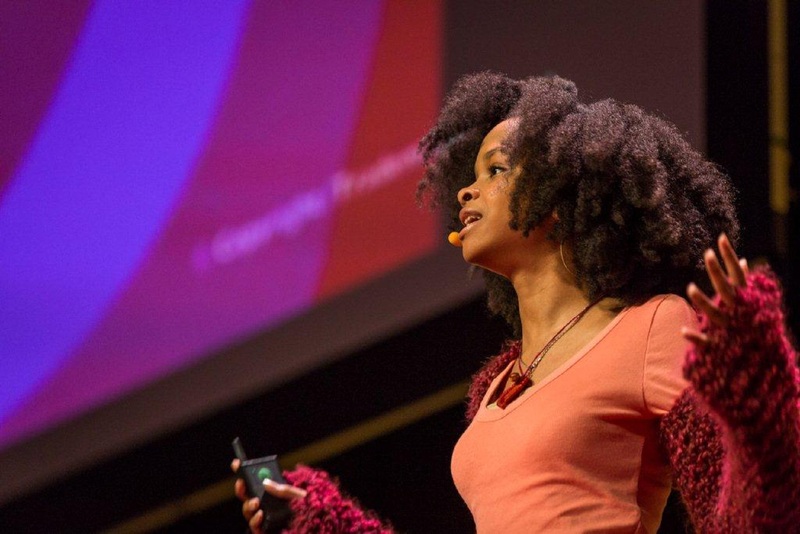 Maya is the youngest female to do two back-to-back official TEDTalks. Book Cover Image (jpg): You Got This!